Interview: How much influence does Italy have on fashion today? For our brand new Italian Issue we talked to several insiders and industry veterans. One of them is Milan’s uncrowned king of nightlife and luxury streetwear, Marcelo Burlon. We spoke about Burlon's view on Italy’s fashion impact and why he dreams of moving back to his native Patagonia even though Milan is so prominently incorporated in his brand name. Marcelo Burlon came to Italy from Argentina with his family at age 14, looking for “a better life,” without speaking a word of Italian. From his first stints working in the discos around Rimini, Burlon gradually built up a network of club kids, DJs, designers and general creative thread pullers that eventually led to him settling in Milan and hosting the big-name fashion week parties there from Dolce & Gabbana to Prada. After a while he started selling his own T-shirts, printed with feather or snake motifs, always closely bordering on kitsch. They were an instant hit and culminated in the 2012 launch of Burlon’s County of Milan line. 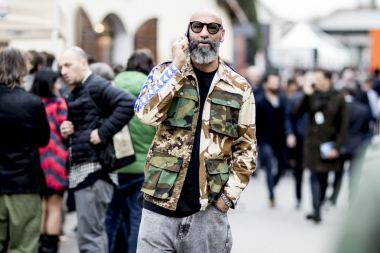 With his roots in nightlife, his strong presence in communities and social media and his luxe street approach, Burlon is Italy’s most prominent example of a new breed of designers/multidisciplinary creatives (including Virgil Abloh of Off-White, Shayne Oliver of Hood by Air and Heron Preston) challenging the traditional rules of the sometimes archaic fashion system. In your opinion, which is the most fashionable place in the world right now? Tokyo is the most fashionable place. Most kids on the streets there look great and have a refined, quite fresh, sense of style. There’s so much inspiration to gain from the street style; they go from super crazy to very minimal but cool. Also some of my favorite brands, like Yohji Yamamoto, Mastermind, and Undercover are from Japan, so I guess the country itself has a great influence. And which is the one with the most influence on fashion/the fashion business? However, China in general has the greatest impact on fashion as that’s where the most products are being sold and where customers spend the most. Many times Chinese citizens may also buy abroad from China, however they still buy the most. Together with France, Italy is traditionally one of THE two big fashion nations in the world. Do you think it’s still as influential as in former decades? I just think Italy and France are the two countries with most brands that are relevant on a global scale. Most of them have such a legacy that everyone in the world associates their names with fashion, even not knowing what they do or did in the past. Also, Made in Italy or Made in France are labels associated with some kind of craftsmanship that is not necessarily there. What is the special something that the country/its inhabitants give to the world of fashion that is unmistakably Italian? High quality at high prices, which sounds very quite easy, but I’d second guess. What is it that Italy might be lacking compared to other fashion showgrounds such as New York or Tokyo? I guess there are many differences, but different doesn’t necessarily mean it misses something. You are one of the most prominent representatives of the high-end/luxury streetwear scene that emerged a few years ago. Where do you think that category is going? I’m not a psychic, but for a while sportswear and fashion speak the same languages, or actually, fashion speaks the language of sportswear, so I think it became way bigger than a trend or a seasonal thing. Also, it doesn’t necessarily have to go to a precise direction–we’re talking about clothes so let’s be free and play with it. With hoodies and sneakers on the runway at traditional fashion houses and street style and Instagram adapting catwalk trends in no time, will there even be a difference between luxury and street fashion in the future? It becomes luxury when the price is high. What’s the best thing about living in Italy for you? I’m actually dreaming about moving back to Patagonia where I came from, so….